Rescheck Dictionary | $79 RESchecks & Manual Js. $79 Any Plan. Any State. Today on the Reschexpert blog we want to talk about the most commonly used Rescheck definitions that we hear on the Rescheck Help Line. 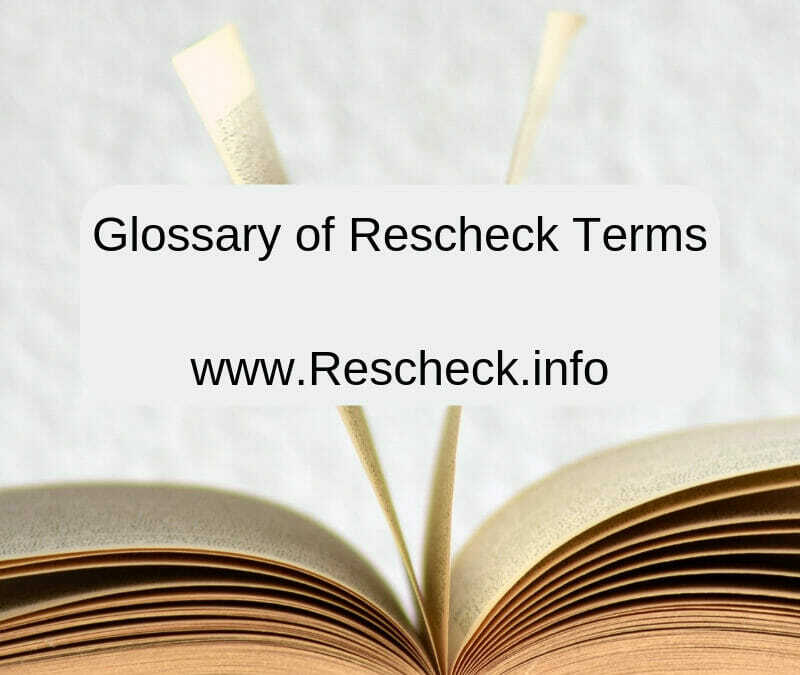 This dictionary or Rescheck Lingo is designed to help you through your Rescheck process and allow you to hear words and language you may have never heard before. Rescheck Report: This is a 3 part report developed by the Department of Energy to help put all members of a construction project on the same page. Rescheck Calculations. The first page of your Rescheck report. Measures the area and R value of ceilings, walls, and foundation. Also the window and door energy efficiency and compares it to the climate zone where you are building by giving you a pass or fail score. Rescheck Checklist: This is typically pages 2-10 of your Rescheck. It is a plan and onsite based inspection form that allows your building department to easily inspect your structure based on the required items in your code and on your Rescheck Calculations. Rescheck Compliance Certificate: This is the last page of your Rescheck report. It included duct insulation, HVAC unit sizing, and water heater efficiency. This is typically placed on the electrical panel of a home so any prospective buyers, in the future, will know exactly what insulation was installed and that you followed the applicable energy code when generating your Rescheck. Rescheck Software: The two current softwares for creating Reschecks are Rescheck Web and Rescheck Desktop. 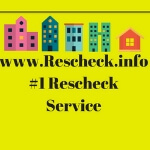 Rescheck Web: This is the online version of Rescheck software that can be used anywhere that there is an internet connection. It is constantly updated with the newest codes and allows sharing among team members. Rescheck Desktop: This is a hard drive based Rescheck software that you can use in slow, spotty, or no internet locations. Projects are stored on your hard drive. Rescheck for New Construction: This is a Rescheck generated for a new structure being erected on a property. Rescheck for Addition: An addition is additional heated square footage being added to a home. As long as the existing structure is not disturbed, typically on the addition will need to be Reschecked. Rescheck for Alteration: When no additional square footage is being added but you are altering the insulation or building components of a home. This looks at the new items that you will be installing and generates a report accordingly. Do it Yourself Rescheck: You are allowed to create your own Rescheck Report. Rescheck.info and the Reschexpert blog exist for the sole reason of making the Rescheck the easiest part of your construction project. Free resources, blog posts, and the Rescheck help line all give you the skills and information needed to create a DIY Rescheck. IECC Energy Codes: Rescheck softwares include all the recent international energy codes like IECC 2018, IECC 2015, IECC 2012, IECC 2009, and IECC 2006. State Specific Energy Codes: These are codes that states worked together with the Department of Energy to develop. Based on specific climates and state specific needs. The options for these codes are Florida 2017, Georgia 2011, Massachusetts 780 CMR 51.00 9th Ed., New York City Energy Code, North Carolina 2012, Puerto Rico Energy Code, Utah 2012 Energy Code, and Vermont 2011. You can also locate the Wisconsin Uniform Dwelling code of 2009 on some older versions of Rescheck Desktop. This basic list of Rescheck Definitions should guide you through each step of your Rescheck process. If you thing of other terms that you hear in your daily Reschecking endeavors please email them to [email protected] and we will try to use them in future episodes of the Reschexpert blog. Thanks again for reading and if you are ready to get started on your Rescheck or Manual J just email your plans to [email protected] along with your jobsite address and we will create your report in 4-6 hours and send it back to you.